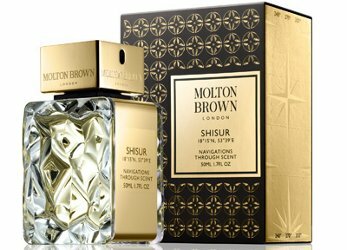 Molton Brown has launched Shisur, a new addition to their Navigations Through Scent series. The scent was named for the possible location of the lost city of Ubar, in Oman. May contain mystery. A thousand Arabian nights in a city beneath the sand; a legend bathed in golden slumber. The forgotten spectacle of trading glory, rediscovered in the heady oil of oudh, brooding and rich. Opulent. Precious. Intense. Shisur was developed by perfumer Jennifer Jambon; notes include orris, caraway, saffron, frankincense, cedar and oudh accord. Molton Brown Shisur is available now at Molton Brown in the UK, £90 for 50 ml. Robin- You forgot the “Please god, no more oud” tag. Okay, even I, a serious oud fan, am crying uncle. Yes, it’s part of the Oudh accord and gold range. I tried when I was in Harrods and actually ended up buying the body wash and body lotion as I did like them (not sure I needed the flakes of gold leaf inside the shower gel though !) and the shisur was actually quite nice. Hey everyone , hope your all having a nice day ? Was curious if anyone might throw out a newer fragrance for men that will be good for this fall and winter ? You’ll probably get more response if you come back on Saturday for our next open thread poll, and maybe tell us what you like and don’t like?